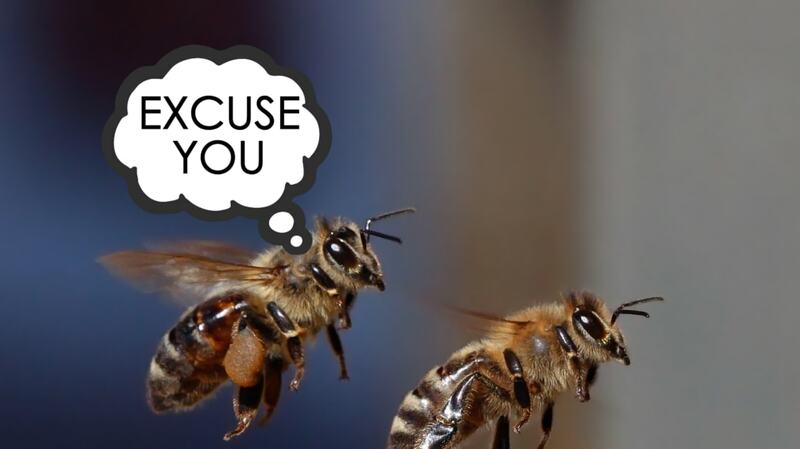 British scientists say startled honeybees emit a teeny “whoop!” noise when jostled or head-butted by another bee. The team described their findings this week in the journal PLOS One. Bee societies are astoundingly sophisticated and complex; they’re strict hierarchies in which every bee knows its job and its place. To keep this social machine humming along, bees rely on multiple forms of communication: chemical signaling, electrical impulses, gestures (like their waggle dance), and sound. One of the most common sounds is a quick little wing-buzz used often in crowded colonies. Bees seem to make this noise when they ask another bee for food and as they interfere with another bee’s waggle dance—a move that tells the second bee to change its plans. Because the buzz seems to be used to abort the waggle dance and any foraging that might follow, scientists call the noise the “stop” signal. So what is the buzz about? Surprise, it seems. Video footage from inside the hives showed that bees mostly emitted that little sound after another bee had knocked into them, the same way you might say “whoa!” when a stranger suddenly jostles you on a crowded sidewalk. Bencsik and his colleagues propose that instead of calling the noise a “stop” signal, we should call it a little “whoop” instead. The authors suggest that bees, like people, may complain more when times are hard—which means that we might be able to use the frequency of their little whoops to calculate their colony’s stress level.